Enable has established herself among the greats of the turf. Her seven Group 1 triumphs have included three memorable runaway victories in the QIPCO British Champions Series, back-to-back triumphs in the Prix de l’Arc de Triomphe plus a compelling success in the Breeders’ Cup Turf at Churchill Downs. No wonder racing fans are keeping their fingers crossed that the daughter of Nathaniel is kept in training in 2019. Let’s go back to the start of her winning spree. After a taking success in the Cheshire Oaks, at Chester, in May 2017, the Prince Khalid Abdullah-owned filly started 6-1 second favourite for the Investec Oaks at Epsom, with the QIPCO 1000 Guineas runner-up, Rhododendron, all the rage and sent off at odds-on. In a dramatic renewal, run in heavy rain with thunder and lightning rumbling around the track, the front two in the betting had the race between them from two out. Rhododendron, trained by Aidan O’Brien, moved upsides Enable seemingly going the stronger but it was a different story by the end. Enable galloped on relentlessly to win in a record time under Frankie Dettori as the favourite buckled and, by the end, was five lengths clear. Rhododendron could simply not keep up, but she, in turn, was six lengths clear of the third home. Trainer John Gosden was enjoying a second Oaks triumph and said: “She is a big powerful strong filly. She always had a good frame on her and she filled it out well. “I just took my time with her and gave her one race as a two-year-old at Newcastle over the straight mile which suits that type of horse and then she ran great at Newbury [finished third, April 21]. The Investec Oaks was some race. Nathaniel [sire] was a proper mile and a quarter/mile and a half horse and Concentric [dam] is a wonderful mare from a beautiful family. “She is a magnificent filly. Khalid has strong views as to where he likes his horses to run as he knows the race programme inside out but obviously, you have races like the Irish Oaks or go for the King George so these are all things to think about. Teddy Grimthorpe, racing manager to Abdullah, remarked: “From two furlongs out, I was very nervous as Rhododendron seemed to be travelling so well but Enable ran on, lengthened and put the race to bed. Enable started 2-5 for the Irish Oaks on her next start and was similarly impressive, winning easily by five and a half lengths from another O’Brien inmate in Rain Goddess. The Yorkshire Oaks seemed likely to be Enable’s next likely destination but she came out of her race in Ireland so fresh and well that connections took the plunge and ran her in the QIPCO-sponsored King George VI and Queen Elizabeth Stakes at Ascot. There was never a moment when that decision looked wrong, Enable powering to a four and a half length win over Ulysses, with Idaho and Highland Reel the next pair home. Enable duly ran in the Yorkshire Oaks next time and started at 1-4 to beat her five rivals. She jumped out and made all for an easy win by five lengths. 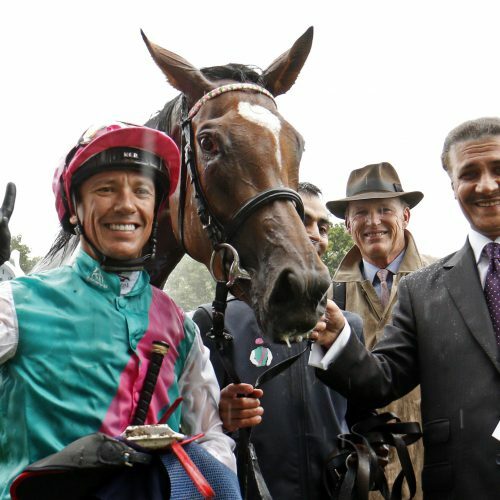 It was a fourth successive Group 1 win for Enable – gained by an aggregate of 20 lengths. She confirmed her brilliance in the Qatar Prix de l’Arc de Triomphe, trouncing her 17 rivals by almost three lengths without Dettori having to get serious on her. “I was very confident all week, she is a tremendous filly,” Dettori said. “I said to John last week she is the best she has ever been. To keep this filly at 100 per cent all year is fantastic. The decision to keep Enable in training as a four-year-old in 2018 was a bold one, but unfortunately she was found to have injured a knee in early May and her reappearance was delayed until September 8 – when she returned in the Group 3 September Stakes. It looked like Enable had never been away. She made all and beat Crystal Ocean, the King George runner-up, in emphatic style by three and a half lengths. Four weeks later Enable became the first British-trained horse to become a two-time winner of the Arc. Dettori had the even-money favourite perfectly-placed on the heels of the leaders before he kicked for home. It proved crucial, as the line came just in time for her – but not soon enough for Sea Of Class. Drawn out wide, the William Haggas-trained filly was dropped out last by James Doyle and was still a long way off the pace rounding the home turn. She rattled home once in the clear to set up an epic finish, but Enable had just enough in the tank to claim a popular victory by a short neck. Later in the month, she journeyed to Churchill Downs in Kentucky for the Breeders’ Cup Turf. The seven previous Arc winners to journey onto the Breeders’ Cup had all been beaten but she rewrote the record books – fending off Magical, who had won on QIPCO British Champions Day just two weeks earlier, by three-quarters of a length in a great race up the straight. The pair drew almost ten lengths clear of the rest. More proof, if it were needed, that she is willing and Enable.